Turnovers? Handpies? Pastries? I don’t know what to call these, but I do know they’ll put a smile on your face. OK they aren’t really supposed to look like that. I’m just easily amused. Here’s what you need to know: Fresh cherries. Cream cheese. Sugar. Puff pastry. 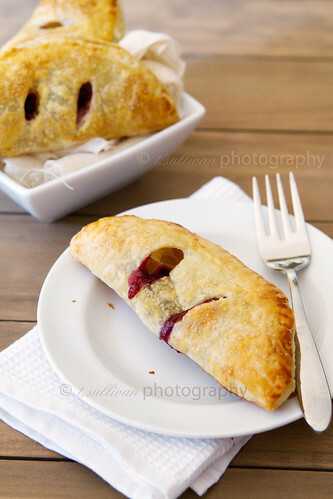 These turnovers are yet another product of my summer cherry obsession. 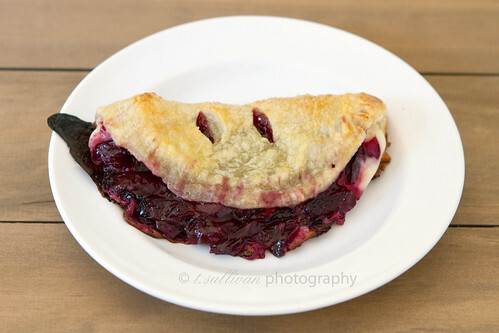 I hate pie crust (seriously) but cherry pies are so quintessentially summer that I kind of wanted to make one. I was also craving something kind of like a danish, so I decided to make a cherry turnover with the addition of sweetened cream cheese. The flaky crust just begs you to bite into it, where you’re rewarded with a hint of creaminess and a burst of fresh cherries like summer sunshine. Best of all, they’re quick and easy to throw together. I love unfussy, casual, eat-them-with-your-hands desserts. The turnovers puff way, way up on the oven, and one might even burst open (see first photo) but don’t sweat it. They’ll taste good no matter what. These are best enjoyed the same day they’re made. If using store bought puff pastry, be sure to only roll it out once. Lightly dust a clean counter top with flour. Using a rolling pin, roll out puff pastry very thin – about 1/8-inch thick. Cut out circles. (I used an upside down bowl to cut out four identical 6-inch circles.) Place puff pastry circles on prepared baking sheet. Refrigerate. Add cherries, sugar, and lemon juice to medium saucepan. Cook over medium heat until cherries release their juices and have softened, about 5 minutes. In a small bowl stir together water and cornstarch. Add to cherries and stir constantly until thickened. Remove from heat. Cool to room temperature. In a small bowl, whisk together cream cheese, powdered sugar and vanilla until combined. To Assemble: Beat yolk and milk together in a small bowl. Working on just half of each chilled puff pastry circle, spread a thin layer of cream cheese mixture and top with cherry mixture. Brush edges with egg wash and fold over to close. Crimp edges with a fork. Chill for 15 minutes. Brush egg wash on top of turnovers and sprinkle with raw sugar. Cut 2 or 3 slits in each turnover with a sharp knife. Bake at 400°F for 15-20 minutes, or until browned. Cool to room temperature and serve. Did someone say breakfast? I’m in! These sound fantastic and I love the ease of using puff pastry. I love how easy these are to make, they look like they’d be a lot more work. I still have a ton of cherries in my freezer, so I may have to make this soon! It seems I’m also easily amused :P I love turnover pastry, it goes so crispy and sweet. These look amazing. Well done. 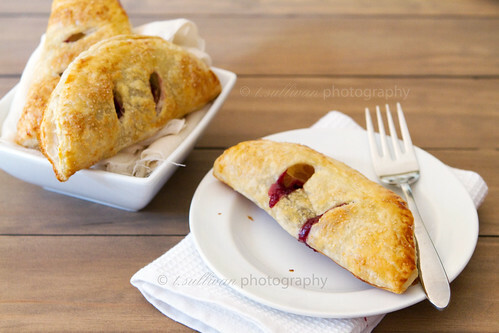 I bet these are so comfortingly scrummy :) lovely little hand pies! Mmmm…these look fabulous! I’m bookmarking this right away!